To any rational social minded agent, it has become abundantly clear—in a positive, equitable, ecologically diverse future, more humans practicing sustainable development are required, across the entire spectrum of human activities—especially faith and business networks. In order to manifest this future, we need centers of education and training for those nextgen leaders and practitioners. 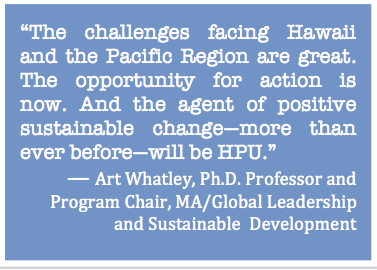 In 2010, Dr. Art Whatley, founder then director, of the Global Leadership and Sustainable Development program, and yours truly, then a graduate student, co-wrote and delivered a proposal for a Center for Sustainable Futures, to the president of HPU. Like what you read—why not contribute to helping spread the word? Previous articleDo you know Haym? Next articleIs Your Big But Holding You Back?